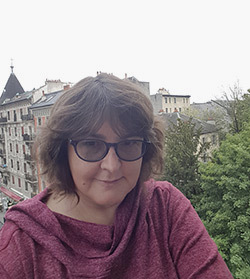 Anriette Esterhuysen was the executive director of the Association for Progressive Communications (APC), an international network of organizations working with Information and Communications Technologies (ICT) to support social justice and development from May 2000 to May 2017. She continues to work with APC as a senior advisor on internet governance, policy and strategy. Prior to joining APC, she was executive director of SANGONeT, an Internet service provider and training institution for civil society, labour and community organizations in Southern Africa. From 1987 to 1992 she did information and communication work in development and human rights organizations in South Africa and Zimbabwe, helping establish email and Internet connectivity in Southern Africa. She has served on several international task forces and working groups dealing with internet governance and development matters and has worked closely with both the African Union Commission and the United Nations Commission for Africa whom she served in the capacity of being a member of the UN’s African Information Society Initiative’s Technical Advisory group. She is currently a member of the Global Commission on the Stability of Cyberspace.